This is one of those 'saw it on pinterest and just had to try it' things. except....it didn't work out so well (which explains why I'm not linking that original post). The original was thick, gluey, bland and had wayyy too much crust. I hate, hate, hate when that happens! Especially when the original recipe was accompanied by beautiful photos. Crush 1 sleeve of graham crackers and spread out evenly in a 9X13 pan. Mix cream cheese and marshmallow fluff on low till blended, about 1 minute. Add in Vanilla extract on low. Mix about 1 more minute. 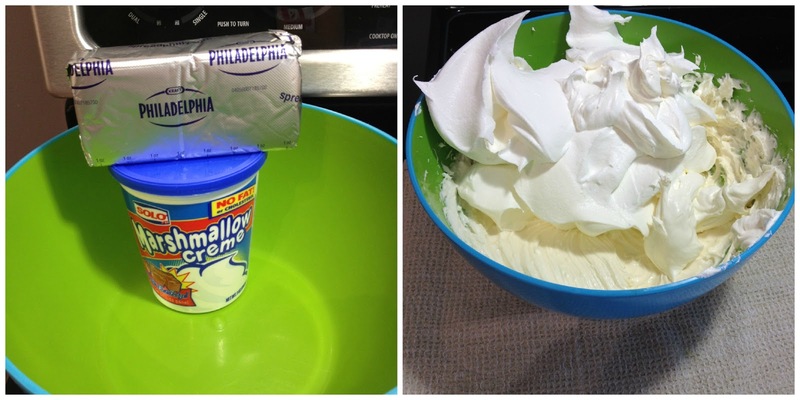 Mix in whipped topping until blended. Spread in pan over graham cracker crust. This can now be served one of 2 ways. Either cut into squares and served with a square cake server or served as a dip. You can break the last 2 sleeves of graham crackers into single sticks and serve this as a dip. It's a little thick, but makes a yummy dip. This worked out well for the first party I took it to...however at the second party they started serving it as squares and eating it like pie. Yummy! Either way it was easy, fast and using the cheaper 'on sale' ingredients didn't affect the outcome at all! If you like this dessert, you'll also like my Stuffed Cheesecake bars! This looks wonderful! I love that you use marshmallow creme. Thanks for stopping by and sharing! Give it a try...it really is yummy! Love your blog hop. See you next week! Oh my gosh, that looks delicious, Lisa! The ingredients alone are making my mouth water. : ) I'm going to have to try this! This looks so good and so easy to make. Thanks so much for sharing with Adorned From Above's Blog Hop. The party will be back this week starting Tuesday and 8:00PM mountain time. We can't wait to see what you have to share this week. This looks absolutely yummy, taken recipe and intend to try it out. Thank you very much. I hope that you have a fantastic day. YW! It's so yummy! Give it a try!